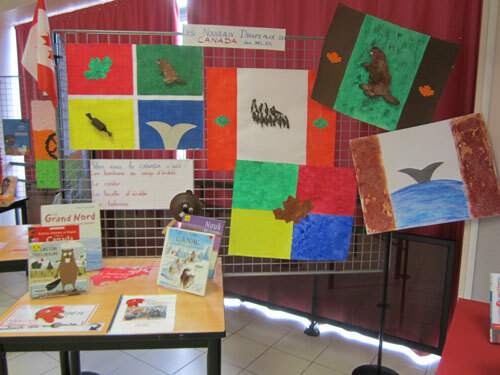 In early September of 2016, the 26 kindergarten students of Edvig and Jessica of Pasteur Primary School in Bretagne (France) welcomed Beaverly, a Canadian cousin of their class mascot beaver Nestor! Beaverly was accompanied by Joelle and Frank from Ottawa, who also carried her suitcase full of books. 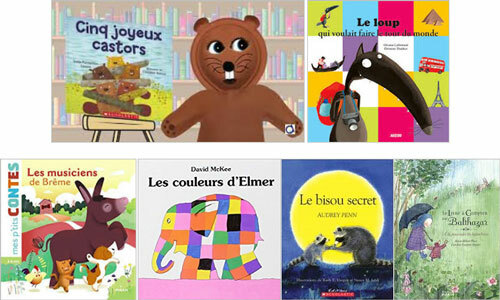 Beaverly was going to share her love of reading with students all over France throughout the school year. 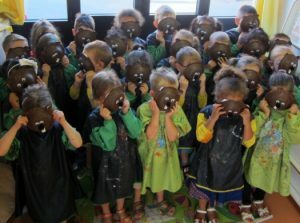 On the first day, we all made Beaverly puppets to take home and we got to taste maple syrup candies! After that, Beaverly stayed in our class for 10 days and shared our daily activities. We enjoyed her favourite books. To our great delight, Beaverly came back in our class in January and February, with new books! We took her with us to the library for our project on citizenship: inventing a flag. Of course, we choose to create a flag of Canada. That led us to another adventure: discovering Canada through documentary books. Four groups of children each created a flag, and we combined them into one flag with a background that reflects the four coulours representing each of the four groups. 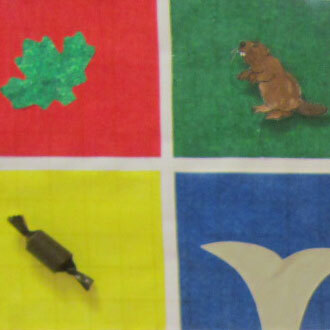 The children included a maple leaf, a beaver, a maple candy and a whale. Finally, Beaverly left for other adventures in the East of France. We regularly check up on her on this website. Thanks to Edvig for her report. If you also want Beaverly to visit your classroom, read this.